I'm tired. I must be because I've just made gooseberry fool with demerera sugar. It was only when I was sieving it that I realised why the recipe calls for castor. Instead being a delicate shade of green, my fool is a delicate shade of mud. A swipe of a taste also tells me the delicate taste of gooseberry has been railroaded over by the commanding taste of the sugar. 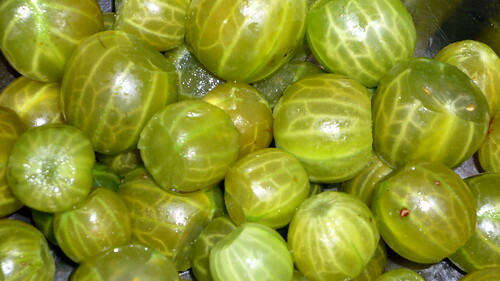 I used all the mighty 300g of gooseberries from my bush too. It's my first ever harvest and I've just gone and ruined it by cooking it with effing brown sugar. Sometimes I could kick myself. Still, on the bright side, you can't go that wrong with a basic recipe of berries, sugar and cream, so even if it doesn't taste as good as it should, it's still pleasantly edible. I can't wait for the weekend! Sleeeeeeeeeeeeeeeeeeeeeeeeeeeeeeeeep. Have you ever not followed a recipe to your regret? Oh hundreds of times, usually when I realise I have not got one of the crucial ingredients and try to improvise with something else. Love gooseberry's and rhubarb, anything tart really, I miss Roses Lime juice cordial. Can't you get lime cordial at your local shop? They stock it in a couple of places here - Intermarche and Mondial Market. There's an article about gooseberries in The Times this morning, about how it's going out of fashion in the UK and the number of producers is declining. Most enthusiasts grow their own it seems. They're certainly a bugger to harvest! Hi, thanks for popping by my blog. Thought I'd reciprocate. Yes, wasn't the tennis great! And both the guys were gentlemen and yet played their hearts out. Encore, I say. Religious fanaticism. Guys, don't get so excited, it's all man-made BUNK! Hi Dumdad, and welcome to my blog too! Me too... lots of times! Good job it wasn't to be served a dinner party hey? ps. Do you subscribe to The Times? I can't get access any more and miss it like mad but not enough to pay as I don't look at it that much... if paying is the way forward they need an intermediate subscription level. Hi Piglet, I'm a subscriber but I don't pay. Are they asking you for money? I wouldn't frighten delicate French palates with a gooseberry fool. It just pisses me off too much when they look mildly alarmed at something they aren't familiar with, then make some facetious anti-Brit food remark and nearly get whatever it is shoved down their throat.